BLASTEC® manufacturer of the original 1760 RPM blast wheel which led to the manufacturing of the world’s most efficient shot blast machines. 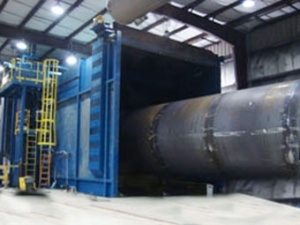 BLASTEC® manufactures high-quality, custom-designed shot blast machines, leading the industry in solid welded, 11%-14% manganese steel blast fabrication. 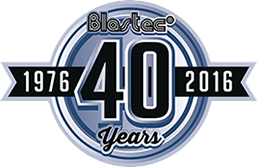 BLASTEC® is the industry leader in field customizing, upgrading and retrofitting all brands of older shot blast machines to the latest blast cleaning equipment. BLASTEC® manufactures the world’s most efficient shot blast wheel, guaranteed to increase production rates when retrofitting to your existing machinery. BLASTEC® offers Blastec parts, replacement parts for the rebuilding of your shot blasting machines and equipment. BLASTEC® is the only manufacturer that guarantees to ship replacement parts for any Blastec Wheel® within 24 HOURS, or we pay the freight. 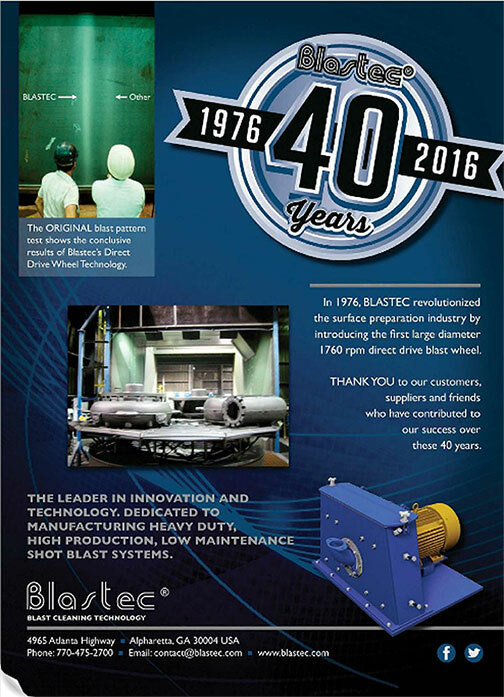 Blastec® is the originator of the 1,760 RPM direct drive shot blast wheel. Since its introduction in 1976, many others have attempted to equal our success. What keeps us ahead of the pack? Our design. Now in its 7th generation, our original concept still remains the leader in the industry. Abrasive blasting is the operation of forcibly propelling a stream of abrasive material against a surface under high pressure to smooth a rough surface, roughen a smooth surface, shape a surface, or remove surface contaminants. A pressurized fluid, typically air, or a centrifugal wheel is used to propel the media. Abrasive blasting of steel substrates can provide the best possible surface preparation for coatings adhesion. If done properly, abrasive blasting thoroughly cleans the surface and creates a surface profile for mechanical adhesion. 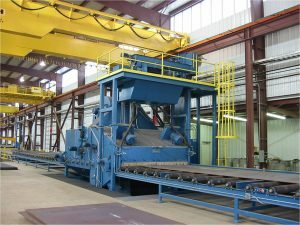 Shot blasting, or abrasive blasting, is an essential part of most steel mill, metal finishing and foundry operations and has been an established finishing technique since the late 1800’s. Blastec® manufactures all types of descaling systems for the structural steel industry at the fastest line speeds available. Whether your application is angles, channels and other miscellaneous structural steel or massive bridge girders towering at sixteen feet, Blastec® can manufacture a system that is right for you. Blastec® manufactures complete preservation lines and plate descaling machines, for both horizontal and vertical applications, at line speeds in excess of any other manufacturer. Plates can be up to 15ft. wide. Our patented horizontal plate machine design can be configured to process structural shapes for pre-blasting materials prior to fabrication as well. Blastec’s® Wind Tower O.D. blast machine provides a high quality, uniform surface profile while removing scale and rust from large carbon steel tower sections. A combination of Smart Blast® control technology and surrounding the tower section with Blastec® Wheel technology results in a consistent anchor profile for today’s modern coatings. This system will dramatically reduce your blast production time and improve the quality of your towers’ surface consistency prior to finishing. The BLASTEC® Rail descaling system features Blastec SmartBlast® Control for maximum blast cleaning efficiency providing a consistent surface profile. 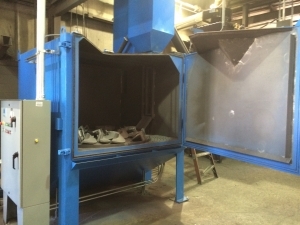 In addition to general overall blast cleaning, our control system provides the ability to automatically concentrate the blast pattern on specific “hard to clean” areas, providing the required degree of cleaning without over-blasting other areas. 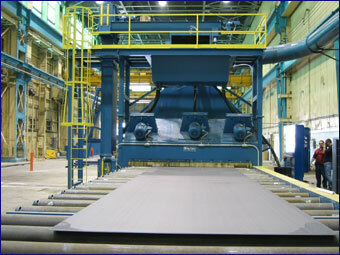 The Blastec SmartBlast® Descaling System decreased cycle times by 50% as compared to other equipment in the market. Blastec® manufactures customized Bar-Wire-Rod descaling machines to the customers’ exact specifications, at line speeds in excess of any other manufacturers typical equipment. From single wire to multi bar machine, processing up to 18 bars at a time. Blastec® manufactures Continuous Strip Descaling machines to the customers’ exact specifications at line speeds, per machine, in excess of any other manufacturer. Two or more machines can be put in tandem to achieve the desired cleaning at virtually any line speed. Blastec’s® unique diamond-shaped double compartment design reduces unnecessary wear on wheel components. The Blastec® blast pattern allows the wheel to be placed closer to the work surface than any other manufacturer while still covering the entire width of the strip.Blastec® manufactures strip systems for both carbon steel and stainless steel. 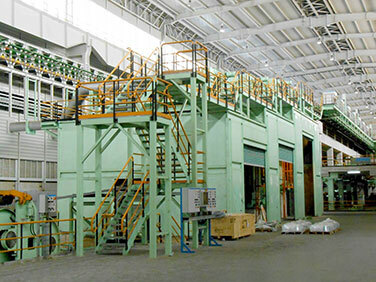 Blastec® manufactures Table Blast Machines for various foundry and descaling applications to achieve the desired cleanliness and cycle times. 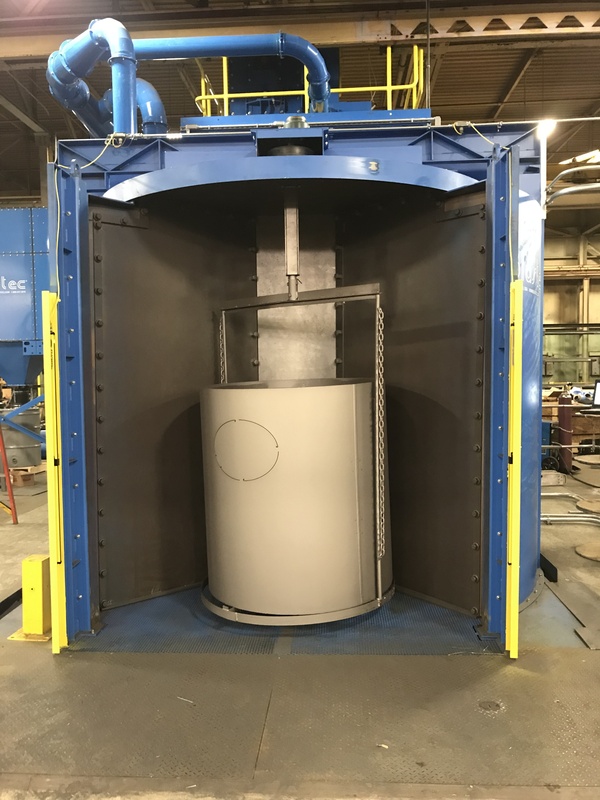 Blastec® manufactures descaling machines for 30, 55, and 85 gallon steel drums and lids, with production rates in excess of any other manufacturer’s equipment. 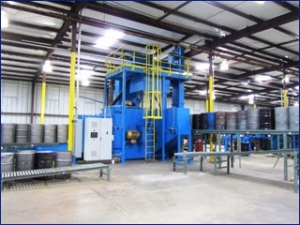 Our patented machine design is capable of up to 4,000 barrels per 8 hour shift. 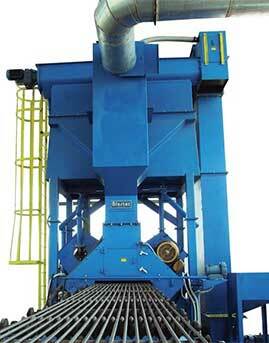 Blastec® lid cleaning machines complement our drum cleaning machines, providing a true drum processing system. Blastec’s ® Spin-Blast machine is equipped with a four-compartment turnstile arrangement for material handling. Each compartment is equipped with a rotating work hook, driven by Blastec’s® exclusive externally mounted work rotation drive wheel assembly. The work hook envelope is 4 feet in diameter by 6 feet high and is designed for the specific product to be cleaned. The Heavy Duty Blastec 34 Cube Tumble-Blast Machine is the most rugged, heavy duty machine available anywhere. 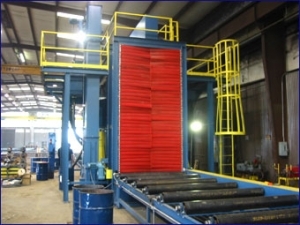 Featuring two ultra-efficient Blastec Wheels, heavy-duty mill belt, manganese cabinet and component protection plates, this machine will out produce our competitor’s comparable equipment while consuming fewer maintenance dollars. Cycle times for the Blastec Tumble-Blast machines are consistently lower than those of competitive equipment. Our well illuminated “stand-alone” manned air blasting systems or integrated linear “touch up and blow-off booths” are custom engineered to meet the Customer’s needs. 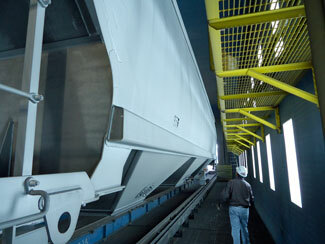 Conveyor systems range from fork truck loading, work car or overhead mono-rail. Full or partial recovery floors are available. 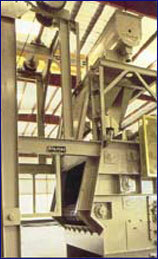 Blastec’s standard recovery system components are an integral part of our cross draft blast booths. Blastec® offers a complete line of Blastec® designed components to upgrade your existing shot blast machine(s) to Blastec® quality standards. Components are manufactured to outlast and outperform the components they replace. 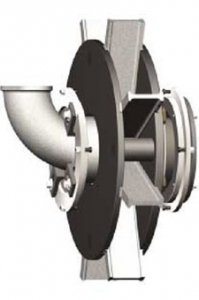 BLASTEC® provides superior replacement parts for all types of blast machines. Our OEM equipment parts are designed and manufactured to resist wear and minimize maintenance labor and cost. For over 35 years and thousands of trials conducted by some of the largest and most demanding descaling applications in the steel industry, BLASTEC® high quality replacement parts are proven to perform under the harshest abrasive conditions.